My daughter starting going to school full time in pre-kindergarten. I was pregnant with my little guy and working full time so I needed a system to stay on top of the whole lunch box thing. Everything mattered, it seemed. She had very strong feelings about her lunchbox, her water bottle and of course, what she would and would not eat at school. As you can see, she's not the typical sandwich-eating girl, which I suppose is what helped me come up with this system in the first place. 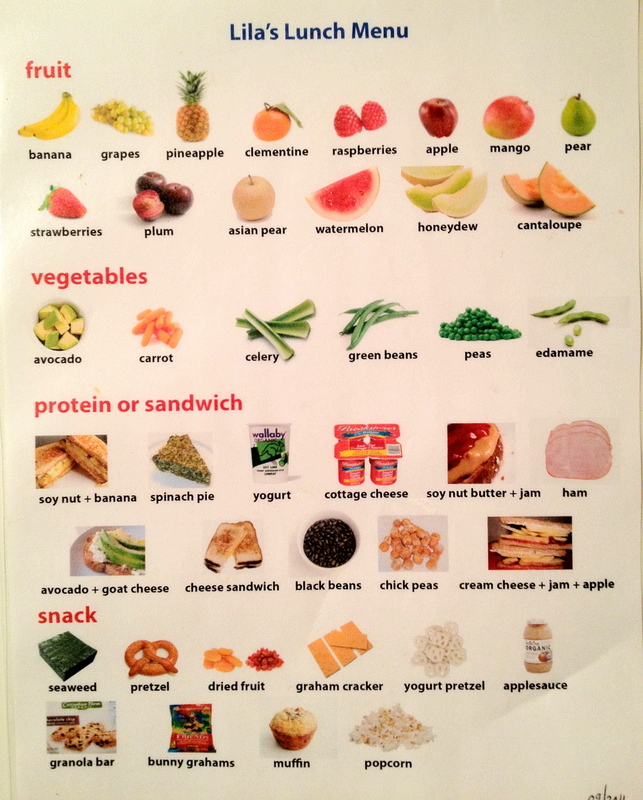 I designed this "menu" and laminated it for our fridge. While it's mainly all about the pictures, I labeled everything to help my gal with her emerging reading skills. We sat together every Saturday morning and she would rattle off what she wanted for the following week. Every day consisted of fruit, vegetables, protein and snack. I noticed that she built in variety to her week. Healthy habits were forming! Each week I took her choices to the grocery store and shopped accordingly. Mornings were a breeze - I just consulted the list and packed her lunch. We were both delighted. I figured that there had to be an easier (less paper-wasting) way. And thus, LaLa Lunchbox was born. I hope you enjoy using it and look forward to your feedback! Older PostLaLa Lunchbox has Launched!